Compatible with HID ISOProx II 1386LGGMN-C100P. 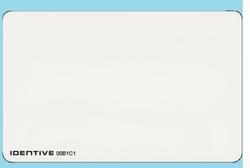 The IDentiv 4010 card has the same size and thickness as a bank credit card. Made in glossy PVC, it can be directly color printed in both sides using a Fargo, Zebra, Magicard, Evolis, and many other card printers. * MINIMUM ORDER 100 CARDS* after qty 100, please order in increments of 50, i.e. 150, 200, 250, etc.